8911 Jaller is a BIONICLE set released in 2007. 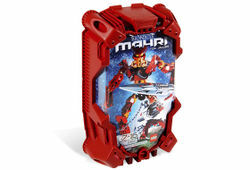 It contains Jaller in his Toa Mahri form with his Power Sword and Mask of Sonar. Attached to him by a chain is his Hahnah crab with a Cordak Blaster mounted on it. In the BIONICLE storyline, he is a Toa of Fire. This is a description taken from LEGO.com. Please do not modify it. (see an archive of the product's page) Fire in the deep!